When parents follow the Pure Phonics® directions like this mom did, they see super results. We applaud Jake’s mom for her diligent work with her son and we are thankful that she is seeing the fruits of her labor paying off so quickly. Way to go! Do you want a great education for your child, great friendships, and all in a loving, Christian environment? Campbell Christian Academy parents and students love their school and so will you! Not only was this young lady an amazing athlete, she also was the valedictorian of her class in high school class. She soon will graduate from UTSW and she is going to be a Physical Therapist. 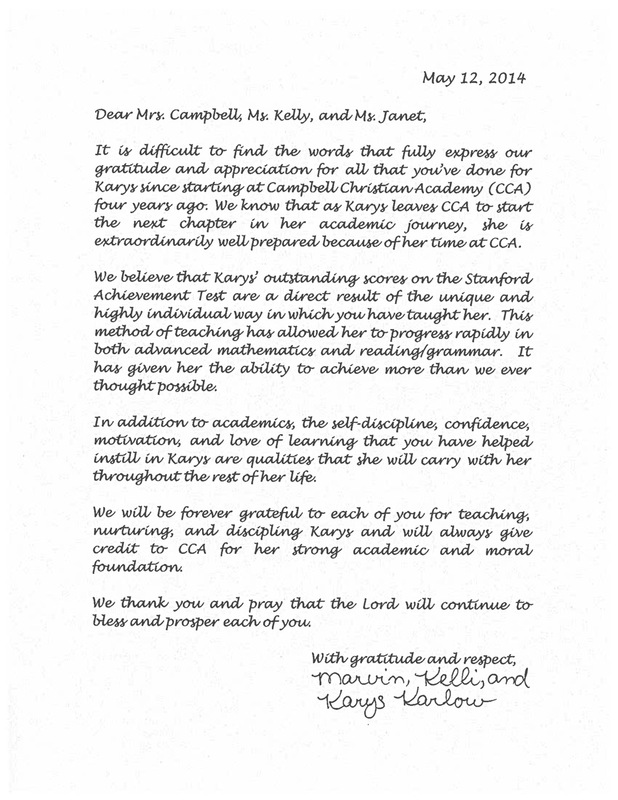 Thank you Emily for your wonderful testimonial to Campbell Christian Academy. We are extremely proud of you! I just wanted to thank you for supporting Nyla throughout her school years at Campbell Christian Academy and for teaching her at such a high level. She went into her new school (6th grade) very prepared. She still refers to lessons that she learned at Campbell. She has excelled in all her subjects and she made the Dean's List. Although she had some "new subjects" she was able to master them because her fundamentals were solid. I will forever be grateful to you all. You guys have been more like family and have always treated her with love and kindness. You just don't see this type of teaching nowadays and I feel that you all "hidden gems" and I'm so grateful to have found you! Not sure where to begin. As we became aware of the education system in the United States, we started to compare it with the foundation we got back home and we started worrying about our kids’ education here in the US. In summer of 2010, we heard such nice things about your school from a parent … an angel sent by God. Our daughter started with the summer school at CCA and then Kindergarten and so on. As time passed our son also started his education at CCA. We have never been disappointed or regretted about our decision to join CCA. There are mainly three wonderful things we appreciate about CCA. First is the great foundation the kids get in Math and English. Second is that all of the parents can talk with all the teachers before and after the class every day even without an appointment. Third is every day the teachers will write about the student’s performance in the class and also what is to be studied at home. If parents don’t go to the teacher after the class and something has to be conveyed, the teachers will walk to the parents and pass the information. We have never witnessed any such co-operation between teachers and parents in any other school. Our kids always have positive things to share about their CCA School and teachers. It has been a great relief and comfort to know that our kids are not only getting a great education but that they are also happy at school. Our kids have loved your school from the start and have never grown bored. You all helped them get well organized and motivated them to learn many things which is not a small thing. After the 2 hour class they have enough time to do their homework, and after that every day they get 3-4 hrs for extra-curricular activities so our daughter was able to do Martial Arts (for 3 years ) and was able to attain her Black Belt and to be on a swimming team, too. Our family thanks you all from the bottom of our heart for everything. We know a thank you note can’t reveal the gratitude and appreciation we all have for you all. So we wanted to say it where others could read it. Thank you Mrs. June for being an excellent Educator! We want everybody to hear about Campbell Christian Academy. We wish all the kids in the US could get this kind of quality education. Your “Pure Phonics” book series is amazing. When our son listens to the CDs he will answer the questions you ask in between as if you are asking him directly. They both love to watch the pure phonics CDs. The number of songs you taught them at school they love to sing at home. Thank you Mrs. Janet for making English Grammar so interesting for the kids and for all the compassion you show to each and everyone in your class. I have seen many times your going to the parents to tell them that their son/daughter had done something great in the class that day. When our son says his small prayer in the car on our way to the school he remembers you with thanks. Thank you Mrs. Kelly. We know teachers like you are one of a kind. Our kids definitely couldn’t have done it without you. You prepared them for the coming years, too. The way you make the kids progress from one step to next is amazing. You make sure each student is excellent in what she has just finished before he moves to the next section. We were surprised how easily you made the kids pass through multiplication. We are sure your students learn more math in one or two days than the students in other schools learn in one month. As we are proud of our kids’ foundation in Math, we are sure our kids will also be proud of you as they grow up. We want to thank Mr. Campbell from the bottom of our hearts. When our kids see you, their faces light up. The care, love, and encouragement you give them is invaluable. The stories and morals you passed to them is a lifelong gift. Because of you, our kids started reading the Bible daily. You are a real blessing for all in CCA. Thank you very much for all of your support. You all have helped our kids to build the foundation for improved academic achievement. The impact of CCA is so significant and we believe it will help our kids for the rest of their lives. We truly can’t thank you enough, and we will be forever grateful and indebted for all you all have done. We are sure our kids will also be thankful and remember you all their lives as we still remember our first Math and English teachers from back home. We just wanted to let you know how much we appreciate everything you’ve done to help our kids to reach where they are now. Even if our kids are inside the school we have the feeling they are in front of us. Thanks for keeping them safe and secure and in the warmth of your love. Thanks for what they are now and the Christian values you are passing onto them. We are waiting for next school year’s adventure. With best wishes from all of us. God Bless!